Sales of wholesale marijuana have skyrocketed in Alaska, driven by new cultivators coming online and existing growers expanding their production to alleviate a supply shortfall. The jump in sales comes as retailers and infused product manufacturers – which had been hit by the supply crunch – are buying up all the cannabis that cultivators can produce to ensure their retail shelves are adequately stocked. Retailers and infused product manufacturers purchased a record 860 pounds of cannabis in June, an 87% increase from May. It marks the strongest month of wholesale marijuana sales since Alaska rolled out its recreational marijuana program last October. Nine new cultivators reported sales in June, the largest month-over-month increase in the number of new growers to date. Existing cultivators – many of which initially grew their plants in one room of a large facility – have now expanded and are operating closer to their peak capacity. The jump in wholesale supplies could eventually lead to downward pressure on Alaska’s sky-high retail cannabis prices. For Christopher Farris – the owner of Green Jar, a retailer in the southern Alaska town of Wasilla – the increased supplies are welcome news. He and other retailers had scrambled for wholesale product in the initial weeks and months of adult-use sales. But retail sales of adult-use cannabis in Alaska are still somewhat of an unknown. Unlike Colorado or Washington state, Alaska doesn’t levy taxes on marijuana at the point of sale, which can be used to calculate consumer spending on retail products. All tax revenue the state collects from its recreational marijuana program comes from cultivators, which pay a flat tax of $800 per pound of flower and $240 per pound of trim when it’s sold or transferred to retailers or infused product manufacturers. Farris said he’s been paying $4,000-$5,000 per pound over the last month but has seen prices as high as $7,000. By comparison, the volume-weighted average price per pound of marijuana across the United States is $1,556, according to wholesale pricing data provider Cannabis Benchmarks. At $4,500 per pound, the 547 pounds of wholesale flower sold in June would be worth slightly more than $2.4 million. Assuming a 100% markup at retail translates into nearly $5 million of flower sales. Sales of edibles and concentrates – traditionally made with trim instead of flower – would certainly add to this total. But calculating their retail value from wholesale sales is not as straightforward. “Cultivators realized they could take some of the trim and put it into pre-rolled joints and sell it at a much higher price than they could to the infused product manufacturers,” Farris said. 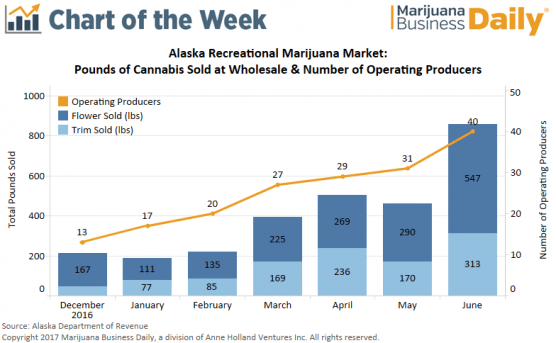 The increased production and more competition in Alaska’s wholesale market is much needed, given that retail marijuana prices are probably the highest in the nation. Rec stores in Alaska that post their menus on Leafly shows that grams of marijuana routinely sell for $20-$25 a gram, while 25-milligram packages of edibles go for about $30. While consumers may be feeling the pinch in the short-term, more growers and increased production likely will eventually put downward pressure on prices.